when working away from home. Another view of my studio. 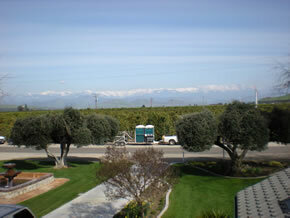 from my current home in Central California. of my little friends in December, 2012. May, 2013 -- I was watching a T.V. show today while I was on a treadmill at the gym. The host made a comment, something to the effect that what happens to you in life is 10% of the story, what you do with what happens to you is the other 90% of the story. This comment rang true to me, as I think back on my life in general, and the last five years in particular. I've been working in the banking industry since 2001. I moved to California with high hopes, when recruited by a Central California bank, in 2006. I purchased a lovely home on 7 acres in Mariposa, the gateway to Yosemite. A few months after that major purchase, I found out that my bank was in trouble from loans made (which I knew nothing about and had was no part of - I am not in the lending site of banking). This was the house of cards that the bank built, and many individuals profited from - and which eventually came tumbling down, taking the bank down with it, and leaving hundreds of employees without jobs. The FDIC shut the bank down, and it was purchased by a larger financial institution, which immediately began slashing. I knew the Bank was in trouble before it failed. They had started laying off non-critical employees; the stock was in the toilet; customers were taking their deposits and moving them to other banks. In the midst of this turmoil - about three months before the Bank was closed, I received a call from a recruiter asking if I wanted to interview for a similar position as I held, at a bank 200 miles away, on the Central California Coast. Suspecting that the Bank may not survive, I made the 4-hour journey and interviewed for the position, which I was offered on the spot. I was faced with a very difficult decision. My son was in high school in Mariposa, and I had just purchased an expensive home that would be difficult to sell in that economy. There were no other banks within commuting distance that would afford me the ability to live at home and continue to work in my field - the nearest banks that might have a position comparable to mine, if they were even hiring, were 80 or more miles away. The job on the Coast involved a pay cut, but at least I could continue working and supporting my family. Do I take the new job, or go down with the ship, as my old Bank was failing? I ended up taking the new job on the Coast, and - while I was able to keep my life going and my family housed - I would have to say that started several of the most difficult years of my life. Every Monday morning I would get in my car at 5:00 am and start the 200-mile journey to work. I'd drive straight to the bank, and stay on the coast, working until Thursday or Friday afternoon, then make the journey back home. 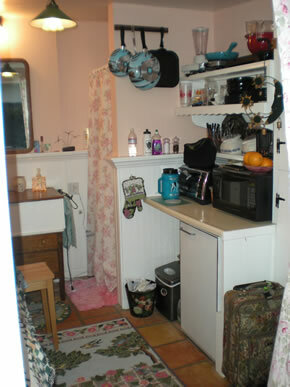 During the week I stayed in a tiny "studio" apartment that I rented (I mean tiny - a 9' by 11' room which housed a twin mattress on wooden drawers, a toilet, sink, and tiny shower, and an under counter refrigerator. I brought in a microwave for cooking. I had a shelf on the wall for a t.v., and I kept a laptop there which allowed me to get on line after work.). There was no other furniture in the room. Just the bed. This was the least expensive place I could rent, and I was trying to keep my cost of living down there, as I was also paying for my home back in Mariposa, and I'd just taken a pay cut. I lived in the room, during the week, when I wasn't at work, for about 2 years. 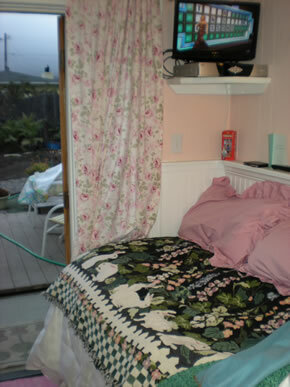 The nicest thing about these two years is that the room was one block from the Pacific Ocean in the town of Cayucos. 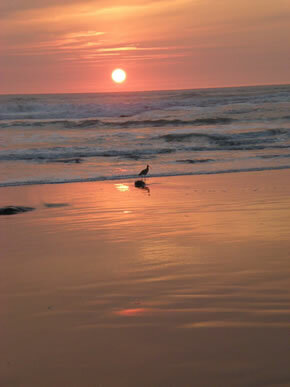 After I got off from work, particularly in the summer months, I would walk on the beach for a few miles at night. I enjoyed my boss and the people I worked with at that bank, and I did the best job I could for them. But, I don't think they ever realized how unhappy I was. These years took a toll on me. I didn't know how I was ever going to get my family back together, with a house I couldn't sell in Mariposa, and working in a location where I couldn't afford to buy or rent a place big enough for all of us. I missed my home, my pets, and my family. There were many nights I would lie in my little twin bed and cry. I would think, "What am I going to do? What am I going to do?" In the end, I just kept doing what I had to do to support my family. And I didn't give up. I looked for a way out, and at Christmas, 2010, that path opened up for me. At the end of 2010, another recruiter called about a better job. This time, the bank was a little closer to Mariposa, the position was better, and the salary was greater. I interviewed for the position a few days after Christmas, and was offered the job on my drive back home. I accepted the position and started work with my current bank on January 31, 2011. Things were looking brighter. I rented an old, two-bedroom trailer in the mountains east of town, about 15-20 miles from work. It was a bit of a ram-shackle residence - in fact, it was a dump - but it gave me more room and more of a sense of having a home. I started looking for a new house for the family, which in this area of the state was more affordable than the coastal area in San Luis Obispo County. I found a lovely home on an acre in the middle of orange groves, and I was just able to qualify for financing with a minimal down payment, while also carrying my Mariposa house mortgage. Memorial Day weekend, 2011 - my family moved in. For the first time in 2-1/2 years, I was able to go to work in the morning, and come home to my own house, family and pets at night. For another year and a half I struggled financially with owning two homes, and eventually, in December 2012, we sold the home in Mariposa. It was a bittersweet occasion. I loved the house and the property, and living in the Mountains. I also essentially lost my life savings - every bit of equity I had, and took a tremendous financial hit selling the house. But - I was finally able to stop bleeding financially, and my family was together again. I could sleep in my own bed at night, without worrying about paying two mortgages. It's now Memorial Day weekend, 2013. Where has life taken me? I have got a great senior management position at a good, stable bank - I would go so far as to say it's the best job I've ever had. I've had some successes through work which this year enabled me to attend a conference at a beautiful resort in Kauai as a finalist for an award for the bank, and to be interviewed for an article in American Banker Magazine. An artist friend asked me to write an essay about him for a prestigious museum show in September 2013, and my 3000+ word essay will appear in the museum catalogue this fall. I get to go home every night. My pack of small dogs (which includes the more recent additions of some tiny Chihuahuas) greets me enthusiastically every night, letting me know I'm the light of their lives, and they are of mine. If I wake in the middle of the night, while the rest of the two-legged residents of the house are asleep, my four-legged babies are my therapy, lying beside me, ready to be petted and hugged. I have a beautiful home in the orange groves and own 25 +orange and other citrus trees, as well as two olive trees, an apple tree, and an avocado tree--and I think it's safe to say I'll never get scurvy! I have some new (and resurrected) interests and hobbies. I am working out with a trainer three days a week, on my lunch hour. I have started re-purposing old end-tables and nightstands that I find at thrift stores into indoor dog houses (tentatively named "Bitsy Beds" after one of my Chihuahuas, and which you may see eventually on www.bitsybeds.com). I am thinking of selling the dog houses, and donating a portion of the profits to help small dog/Chihuahua rescues - as sadly Chihuahuas and Chihuahua mixes are the most euthanized breed in southern California animal shelters. That breaks my heart, as they are such wonderful little dogs with big, big personalities. I've started painting a little again - never a real skill, but something I enjoyed dabbling with a decade or so ago. One of my little Chihuahuas may be show quality, and I am also thinking about taking her to some dog shows (something I did for years with my mom as a teenager) on occasional weekends. I am recovering financially, and hopefully in some years I'll recoup more of what I've lost in the past five years, although I will probably never fully recover. I feel my life is back on track again after many years of being derailed. I know that many people faced hardships in the past few years with the economic downturn and housing crisis. I was one of them. I am proud of the way I kept going, kept a roof over the heads of my family and pets, kept paying my bills - although it did not come without personal sacrifice. People have commented that they couldn't do what I did. But, I think they would if push came to shove. You do what you have to do to survive, and never, never, never give up. Life is 10% what gets thrown at you, and 90% how you deal with what is thrown at you. You must be strong. My husband has always told me that he knows I'm happy when he hears me singing around the house. I'm singing again. Copyright © 2013, sarahscott.com and JupiterSales.com.